Running a business is hard. 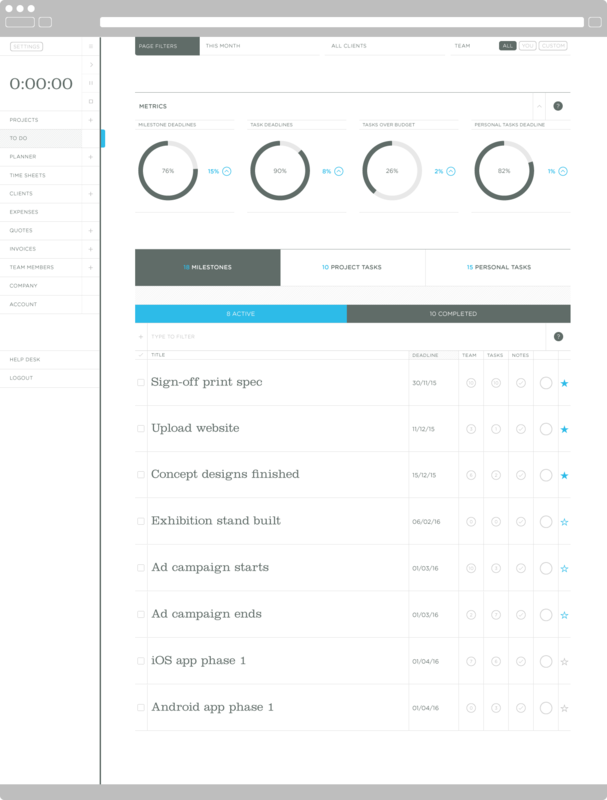 Thrive’s a great assistant and an elegant way to ensure your creative projects run smoothly. Keep up-to-date with your workload, review your performance, analyse percentage of deadlines met and manage your time and tasks. Stay on-top so you can take on more and increase earnings. Time sheets that are effortless to maintain; and if you forget to hit start, time’s easy to enter manually. What’s more, Thrive lets you assign hourly rates to work types so you can charge more for certain skills, and analyse billable and non-billable hours. 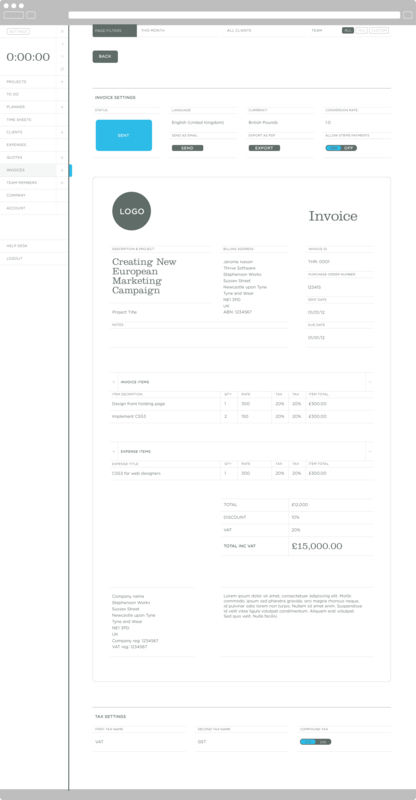 One-click invoicing means great looking invoices are quick to create and simple to send. 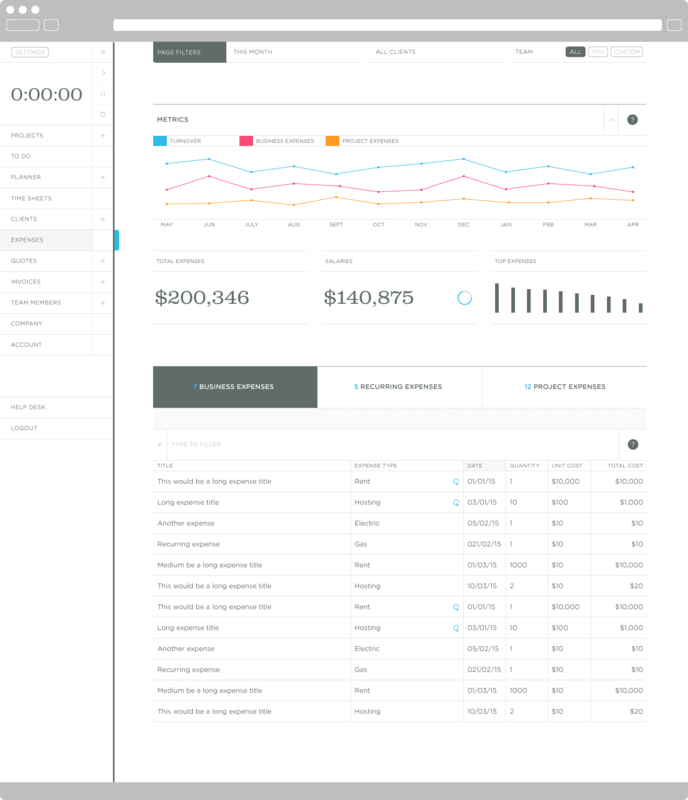 Fields are instantly filled out with the necessary details, ready to fire off to clients with a single click, saving time and helping you get paid faster. 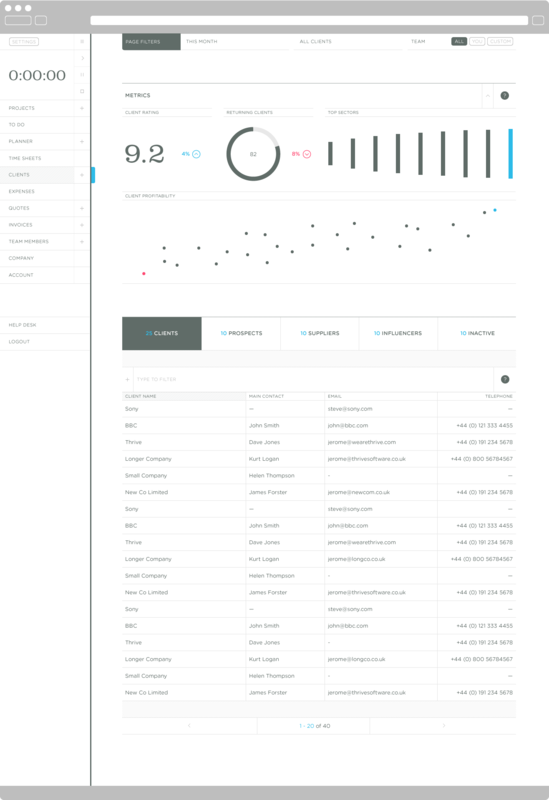 Thrive distills your business data so it's easy to understand and act upon. Facts and figures are all interpreted for you - then beautifully presented so you can take advantage. 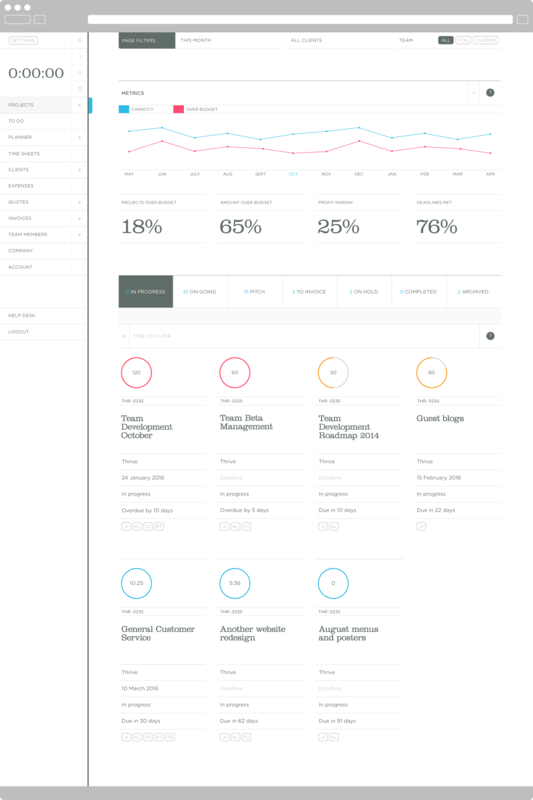 Thrive helps you keep an eye on what’s coming in and going out with simple visual metrics. 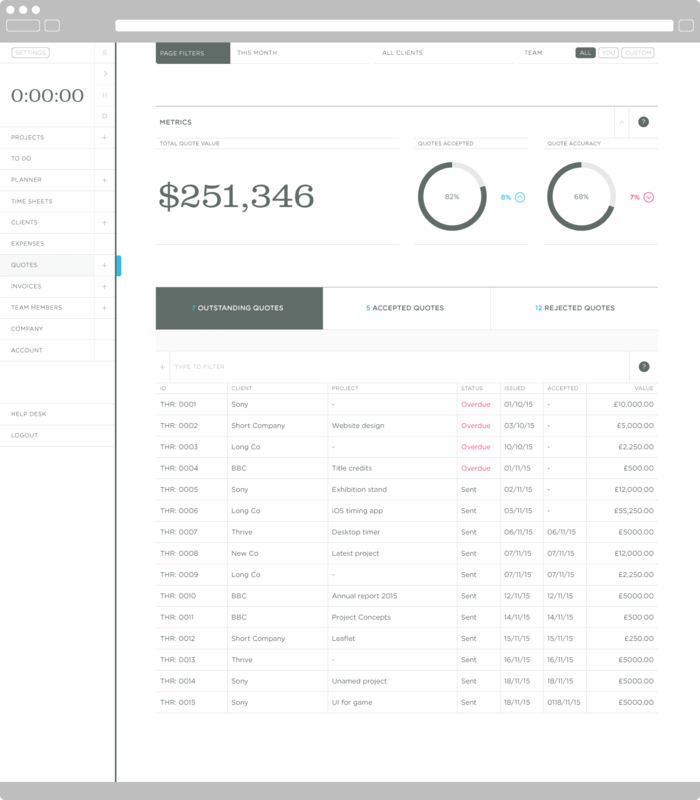 It lets you set up and monitor recurring costs (like rent, hosting and utilities), and easily add random one-off expenses so you can see where money’s going at a glance. Milestones and tasks are brought together in one place so you can focus on what to tackle next. Metrics give feedback on your performance helping you bring jobs in on budget and deliver projects on time. As your freelance business grows, so too will your client list. Thrive’s Client section lets you store all your contacts’ details and organise clients, prospects and suppliers so you can keep track of who’s who and bring in more business. Send slick looking professional quotes to start projects off on the right foot. Clients can easily accept your quote and with one click you're ready to go. If you'd like to find out more about Thrive, join our mailing list. We promise we won't bombard you with emails. 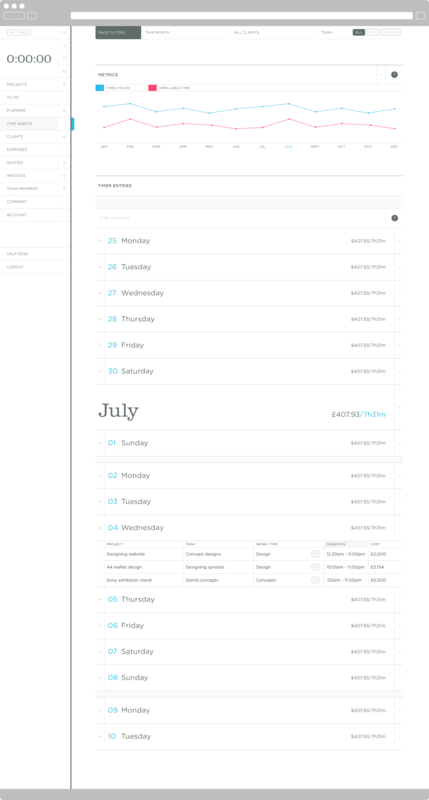 As well as building one of the best project management apps, we also have sent pretty cool emails. They’re beautifully designed, full of interesting content including: killer blog posts, user features, partner offers, and more.